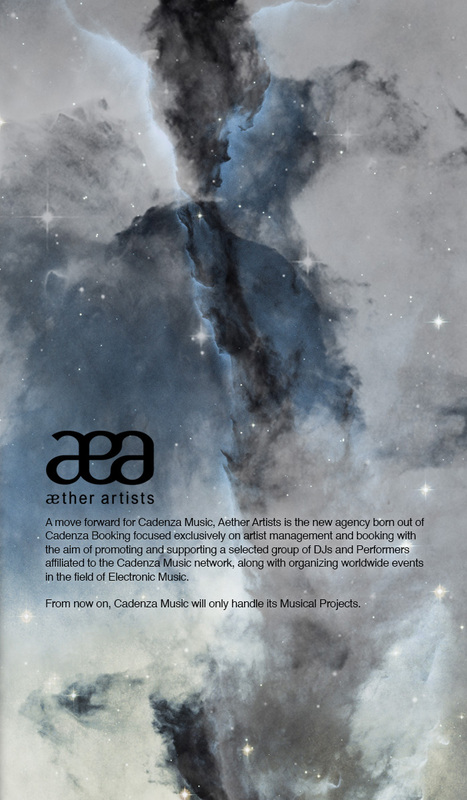 A move forward for Cadenza Music, Aether Artists is the new agency born out of Cadenza Booking focused exclusively on artist management and booking with the aim of promoting and supporting a selected group of DJs and Performers affiliated to the Cadenza Music network, along with organizing worldwide events in the field of Electronic Music. From now on, Cadenza Music will only handle its Musical Projects. The latest brainchild of Luciano, the company strives to provide a platform for the development of its artists’ careers and creative endeavors, as well as for their personal growth and musical achievements, allowing them to design a new architecture of their future and enhance their potentials in today’s competitive and ever changing Dance industry. Taking inspiration from the label’s exciting plans and projects for the year 2014, the agency’s vision wants to further its roster’s profile, becoming a landmark of artistic and aesthetic innovation. Gaining knowledge and expertise from previous experiences in the field of artist promotion and booking, Aether Artists Management is run by a close circle of individuals sharing common goals and duties: counting Luciano himself, Idriss Dib and Amélie Nicolet as Directors, the company’s strong drive and long time commitment to its concept are what sets it apart in the current music business. Granting creative freedom to its DJs and Musicians and advising on every matter concerning their career and work is a key factor and a major strength. A call for unity in an otherwise adverse and tough environment, Aether Artists thrives on the family-like bond among its members and a unique sense of belonging. Based in Barcelona, the company represents Cadenza artists such as Argy, Cesar Merveille, Dandy Jack, Ernesto Ferreyra, Felipe Valenzuela, Felipe Venegas, Luciano, Marlowe Live, Michel Cleis, Mirko Loko and Valentino Kanzyani, plus a number of newly signed talents like Franco Cinelli, Gianni Callipari, Eduardo De La Calle, Gas, Julietta, Hash Hendrex and Ezikiel. Staying true to its genre-defining musical heritage and outstanding artistic contribution to the Techno and House scenes, Aether Artists Management looks forward to bringing its DJs and Performers to clubs and parties around the world and to filling dancefloors everywhere with its one of a kind blend of styles, influences, beats and melodies.